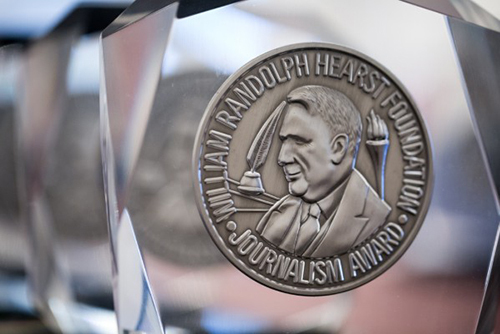 Nicole Harvey, a senior ADPR major at the CoJMC, won tenth place in the Multimedia III/Enterprise Reporting Competition of the 2018-2019 Hearst Journalism Awards Program. There were 72 entries from 41 schools submitted nationwide. Sue Burzynski Bullard, an associate professor of journalism, went to India in March to teach a series of journalism workshops. She was part of a seven-person team assembled by the Poynter Institute to conduct the workshops for Indian editors and journalism educators. Ryan Smith won a grand prize for a video PSA for his Nebraska Foodbank public service announcement for television. Ryan Swanigan won a grand prize in audio promo for his 30-second “Jazzy Vibes” radio promo. The National Broadcasting Society gave out the awards at the 51st Annual Undergraduate Student Electronic Media Competition in Burbank, Calif., on March 15. Brianna Foster is one of only 12 top students to earn a CBC-UNC Diversity Fellowship. The workshop will be held at Capitol Broadcasting Company's WRAL-TV (ABC) in Raleigh, N.C., and the University of North Carolina March 12-16. Bobby Cainan Calvan will cover underreported diversity issues in the state thanks to a grant from the Ford Foundation. Calvan will focus media coverage on minorities and lesbian, gay, bisexual and transgender communities in Nebraska beginning in March. The University of Nebraska–Lincoln Teaching Council and University of Nebraska–Lincoln Parents Association honored eight CoJMC faculty and staff at an annual recognition ceremony on Feb. 7. Certificates of recognition for contributions to students were given during the ceremony. Faiz Siddiqui placed fifth in the Hearst sports writing competition for "Astronomical Odds," the story of a 16-year-old whose Major League Baseball dream went awry after three wild pitches. Siddiqui's reporting is one of many stories coming out of depth-reporting trip to the Dominican Republic during the holiday break. The 22nd Winter Olympics is the University of Nebraska–Lincoln College of Journalism and Mass Communications graduate’s fourth Olympic games in the broadcast booth. Kugler is doing play-by-play for Westwood One Radio for long track speed skating and is also co-hosting a two-hour nightly talk show about the games. Throughout the spring semester, 11 University of Nebraska-Lincoln students will be covering Nebraska’s growing refugee and immigrant communities, telling stories and giving voice to some of the state’s newest residents. Welcome to the new staff. Feb. 8 — Senior advertising and public relations major Wyn Wiley of Lincoln took home the Nebraska ADDY® Awards top honor - Best of Show. Overall, students in the College of Journalism and Mass Communications won 10 ADDY® Awards and a special judge’s citation. The American Advertising Federation has selected University of Nebraska-Lincoln advertising and public relations student Jessica Robertson of Aledo, Texas, for its Most Promising Minority Student Program. Robertson travels to New York City to accept the award Feb. 11-14.